Sometimes you want to set up a lot of screens at once. It might be difficult to track which Pi is connected to which screen. This packages tries to solve this problem by showing you essential information about the connected Pi on the screen. Serial: This is the serial number of your Pi that you can also see on the devices page. It is colored in yellow to make it easier to communicate if you have to give someone instructions over the phone. Description: This is the description you assigned to the device on the devices page. This information isn't pushed to the device, so it might take a moment to update if you make changes to it on the devices page. Location: This is the location you assigned to the device. Similar to the description updating this might take a moment. 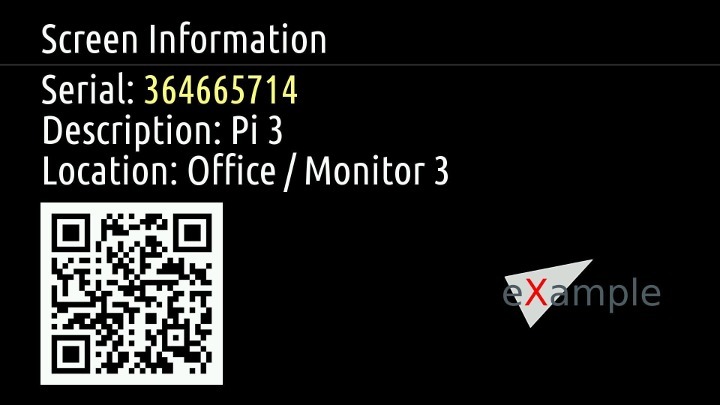 QR Code: When you're logged into your info-beamer account and scan the QR code you get redirected to the device detail page for the device. This allows you to easily modify setting for the device right in front of you without navigating through the devices page. Logo: You can assign a custom logo that appears on the screen. Either visit the contact page or use the issue tracker on https://github.com/info-beamer/package-screen-info/issues. Updated code to support the next info-beamer hosted OS release. Not upgrading might not show the description/location. Want to run Screen Info on your Raspberry Pi?